Thai cooking is generally characterised by the generous use of peanuts and coconut milk. In this Thai Veg Salad with Peanut Dressing , you will experience the magical touch of peanuts, in the form of a sauce with a lot of other exciting ingredients like sesame seeds and lemon juice. The Thai Veg Salad with Peanut Dressing features a brilliant assortment of vegetables, which present you with a miscellany of colours and textures, something that is sure to delight your palate. 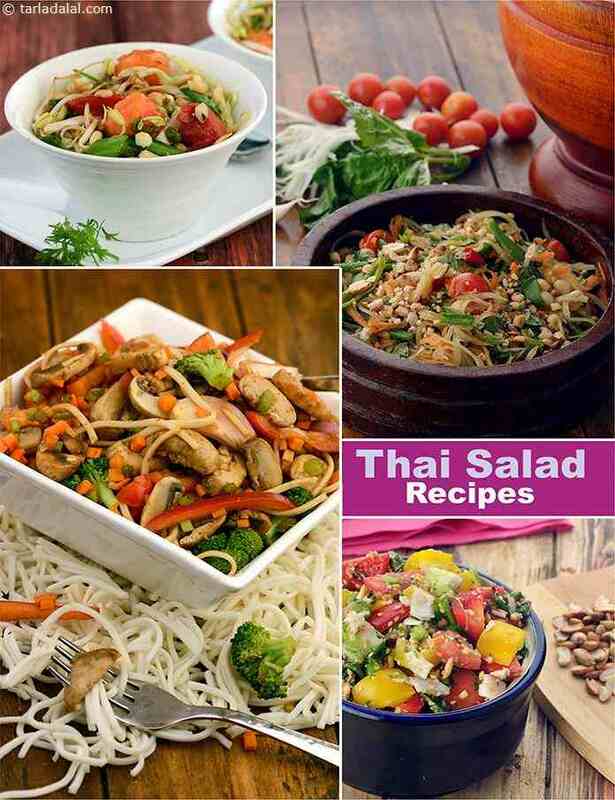 A lip-smacking salad which goes well as an accompaniment to a Thai meal of Thai Style Pumpkin Soup , Thai Sweet Corn Cutlets , Babycorn and Mushroom Curry Rice and Pad Thai Noodles . Goddu saru is a thin savoury lentil preparation which is made from tuar dal simmered in a spicy, tangy tamarind water based curry. Relish goddu saru with plain rice or simply as a soup. Get ready to bite into the tasty and healthy red and green salad with peanut dressing. You can have it as starter as well as meal. The assorted vegetables are served in a mouthwatering and easy to prepare peanut dressing. A Thai cuisine salad rendezvous, Spicy vermicelli Thai salad has the crunchiness of spring onions, softness of water mimosa and boiled vermicelli and the spicy zest of soya sauce and chopped chilli. Enjoy as salad or main course side dish with rice or pasta.